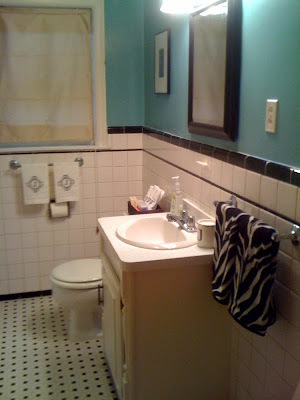 If you recall from this post, we spent some time painting and decorating our front bathroom. For Christmas we got some cute hand towels to go in the bathroom. One set is monogrammed and is from Jake's mom. The other set are zebra print (!!) and are from Jake's Gran. Now, you may know I have an obsession with giraffe print but I think I may have to add zebra to the list - see how cute they are? !